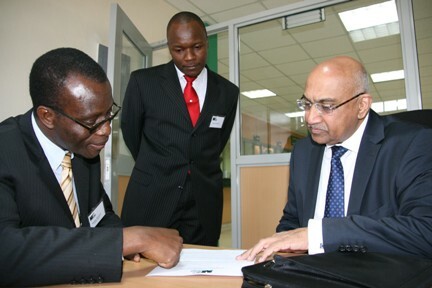 Bank of Africa Managing Director Mr. Kwame Ahadzi (left) takes Mr. Naresh Mehta, Managing Director of Power Technics Ltd (Right) through BOA’s products at the launch of Bank of Africa Embakasi branch, while Jospeh Okumu, the bank’s Product Development Manager (centre) looks on. Bank of Africa (BOA) has opened its 8th branch in Nairobi, increasing the bank’s network to 14 branches countywide. The new Embakasi branch is strategically located on North Airport Road, between Amiran Kenya and G4S. The outlet will serve the wider Industrial area economic zone near the Jomo Kenyatta International Airport “JKIA” that hosts numerous manufacturing, import and export companies with hundreds of godowns, factories and offices. The branch will also serve the many international and local airlines ferrying thousands of passengers and tonnes of goods from the JKIA hub. The vibrant industrial, residential and Small and Medium enterprises (SMEs) community in Embakasi is huge and is expected to grow largely due to the vibrant infrastructure, property development and the ongoing JKIA expansion. The Eastern bypass emanating from Embakasi to Ruiru will also greatly spur development along its path as well as providing a shortcut for many motorists. The activities of the surrounding businesses and the residents complement well with our wide product offering and it is our hope that we will partner and do mutually beneficial business in this community,” said Bank of Africa Managing Director Kwame Ahadzi. With increased competition in the market, Bank of Africa has stood out as a key player in the banking industry. With the strong backing of reputable shareholders, namely the Bank of Africa Group, Netherlands Development Finance Company (FMO) and Aureos East Africa Fund, BOA has maintained an admirable growth pattern and is now one of the fastest growing banks in the country and in the region. “This year has been very successful, with our profits improving tremendously due to the understanding we have of our customers and very importantly the close relationships we maintain with them,” said Kwame. The chief guest during the branch opening event was Mr. Naresh Mehta, Managing Director of Power Technics Ltd who supported Bank of Africa’s entry to Embakasi saying that the area, being very close to the Jomo Kenyatta International Airport is undergoing extensive growth. “I am personally very happy to see this part of Nairobi attracting financial institutions and other key service providers, and this is an indication that the area has come of age economically and I applaud BOA for bringing banking services closer to us”. BANK OF AFRICA KENYA LIMITED is an all public bank which started operations in Kenya in July 2004 after taking over the banking business of Banque Credit Agricole Indosuez, which had operated with only two branches in Nairobi and Mombasa for over 20 years. Today, BOA-Kenya has 14 branches in Kenya spread over the major towns. The bank is a member of the GROUP BANK OF AFRICA which is well established in 13 countries in Africa namely: Benin, Burkina Faso, Burundi, DR Congo, Ivory Coast, Kenya, Madagascar, Mali, Niger, Senegal, Tanzania and Uganda. The Bank of Africa Group also has operations in France. With the opening of the Embakasi branch, BOA presents a rich product portfolio that includes Business Current Accounts, Foreign Currency Accounts, Savings accounts, Personal loans, Children’s Savings account, Salary/Payroll accounts, Asset Financing, Insurance Premium financing, invoice discounting, Chama Account, amongst other medium to long term financing products for the Corporate, SME and Retail sectors.